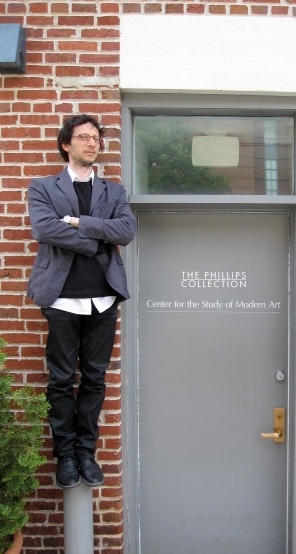 As soon as I met our spring Postdoctoral Fellow , Riccardo Venturi, I knew I would enjoy having him in our midst. He has such a wonderful sense of humor, both about himself and the world. One of my (many) favorite things about him is the set of adorably hilarious idiosyncrasies he exhibits on a daily basis. During presentations and class lectures Riccardo must place his materials – his pencil, moleskine notebook, wristwatch, and sometimes his glasses – perfectly parallel to each other and to his laptop from which he is working. If they’re not positioned “just so” he has to stop and fix the arrangement. Then there’s the glass vase he used as a water glass everyday (he admitted he knew it was a vase, but claimed it worked much better as a water glass). There he was, every day: materials perfectly placed, drinking water from a flower vase.